About 10% of people who’ve suffered from head trauma severe enough to be hospitalized, end up having a seizure. Most of the time, if someone is at risk of seizure after TBI it happens within the first few days or weeks after the accident. However, for a smaller percentage of the head injury population, seizures can start months or years later. Late Post-Traumatic Seizure: These are seizures that happen more than a week after the traumatic brain injury. What’s interesting with late post-traumatic seizures, is that about 80% of TBI patients who experience one will have at least one more seizure during the lifetime. Epilepsy: Any time there are repeated seizures, the person is considered to be an epileptic. About half of individuals with epilepsy as a result of traumatic brain injury continue to have seizures for the rest of their lives. A seizure occurs when the normal electrical function of the brain is thrown off balance. 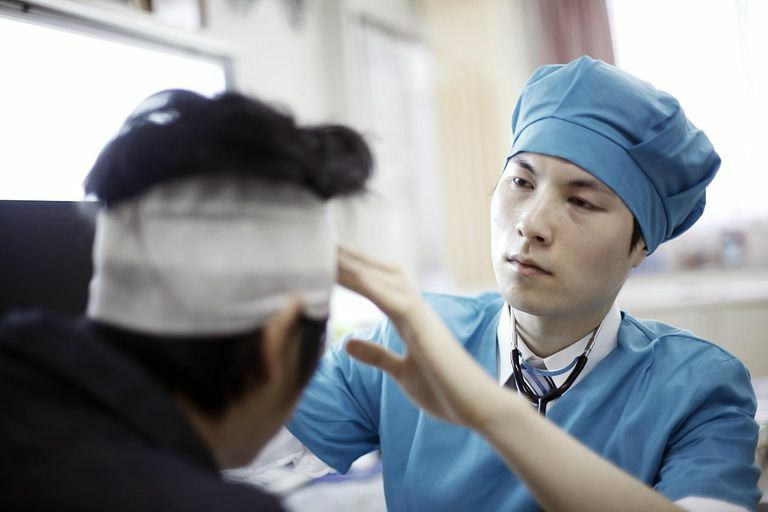 This may happen for a variety of reasons after head trauma from things such as structural injury, swelling, or bleeding. When the electrical signals lose their normal pathways, they can short circuit, so to speak. There may also be a surge of electrical activity. In addition to the seizure activity, there may be a loss of bowel or bladder function. After the seizure, it may take a while to “wake up”, realize you had a seizure and become aware of the environment. For seizures that last longer than 2 minutes, it may take several days to fully recover and you may experience increased confusion, difficulty walking and talking. There are a number of factors that play into one’s risk of developing a seizure disorder after head trauma. Penetrating injuries, such as gunshot wounds, have the highest likelihood of leading to seizures. It’s estimated that between 60-70% of individuals with penetrating traumatic brain injuries will have a seizure. If two or more brain surgeries were needed to repair damage or remove blood clots from the brain after head trauma, the risk for seizure is about 35%. If the head trauma is entirely contained within the skull (no penetrating injuries or surgery) the risk is about 20%. There are other factors, some of which you have control over, that can also increase one’s risk of seizures after TBI. Drugs and alcohol lower one’s threshold for seizure regardless of prior brain injury. After head trauma, drugs and alcohol greatly increase the likelihood of having a seizure. This is very dangerous because if you’ve been drinking or taking other drugs you may be more likely to vomit during the seizure and you will not have adequate control over your gag and cough reflexes. This can lead to aspirating (inhaling) stomach contents into the lungs which can be fatal. Not getting enough sleep and being stressed also lower the seizure threshold. Sometimes a seizure happens years after a brain injury when the person is under a great amount of pressure and feeling fatigued. Other illnesses not related to head trauma can also increase seizure risk. Having a high fever, vomiting and diarrhea may lead to seizure activity. Should You Worry About a Midline Shift After Head Trauma? What Is Causing Your Balance Problems After a Traumatic Brain Injury? How Common Is Insomnia After Head Trauma? Does a Concussion Cause Vision Problems?